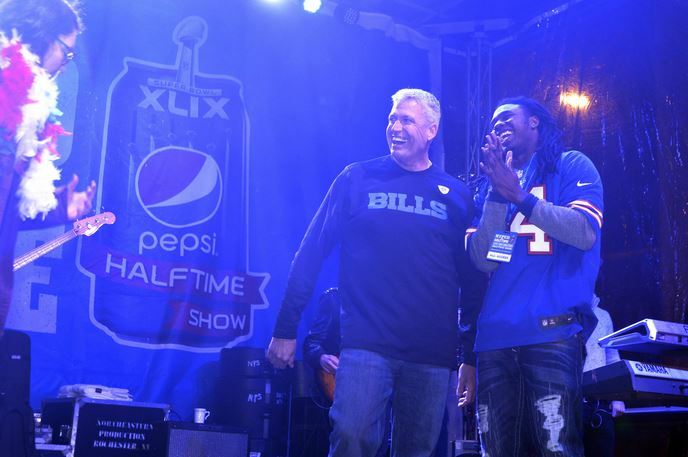 This past Sunday, over 7,500 fans celebrated Rochester’s win in the Pepsi contest with their own ultimate Super Bowl halftime experience headlined by singing/songwriting duo Nico & Vinz, and appearances by new head coach Rex Ryan and Watkins. I read you were a Buffalo Bills fan as a kid, so you can really connect with the people. What’s it like to be a fan and grow up and join the Bills? Yes, I was. They were my favorite team to watch when I was younger. To be here playing for the Bills? Man, it’s great! It shows you how blessed I am. I’m in a great situation with the team I love. I try to go out every week and put my best on the field, fight to get the win at the end of the day. That’s what I think it’s all about at the end of the day as a member of the Bills: fighting with the guys next to you and coming out with a win. Who was your favorite Bills player growing up? Lawyer Milloy for sure, but I had a couple of them. Eric Moulds, Andre Reed, Jim Kelly, Thurman… All those guys. Drew Bledsoe, Nate Clements, Takeo Spikes… A lot of guys. What was your “I’m in the NFL now” moment, on or off the field? Every National Anthem, you realize it’s a blessing. Not too many people get to be on the field, let alone play. Or get to be right next to a Peyton Manning and watch him play. Or, you’re right next to watching the best defensive line in the NFL. Those moments, you realize you’re in the NFL. You’re with the best of the best and you’ve got to go out there and compete. Darrelle Revis, the guy who I think is the best corner in the league. In your football career as a whole, even going back to Clemson, what is your signature moment? I literally think every time you step on the field is a signature moment, but I would say pregame specifically. You’re just blessed to be out there, not too many people are blessed to be in a position like this, playing with these greats. You’re just recognizing how fortunate you are to be on the field and how you are inspiring others. That’s a significant moment. Pregame warm-ups is the best feeling ever; just seeing the fans pack the stadium, you get to work out and you get to try and look pretty in front of everyone. Then once the game starts, everything’s not so pretty! Check out Sammy Watkins on Twitter.